In 2016, we joined with dozens of organizations and hundreds of volunteers to help thousands of people in Saratoga County as part of the first-ever #LeapOfKindnessDay. The idea was simple: invite everyone to use the extra day we are all given during Leap Year to do something kind for someone else. Photo provided by the Saratoga County Chamber of Commerce. SARATOGA COUNTY >> One local chamber has opted to use its “extra day” this month, to help out others within the community. 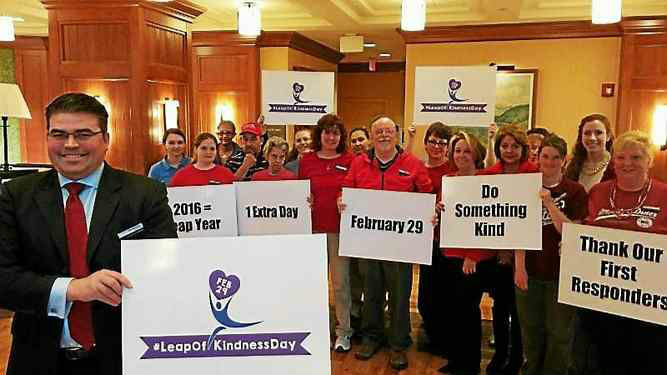 The Saratoga County Chamber of Commerce is preparing to celebrate the first-ever Leap of Kindness Day, on Monday, Feb. 29 by organizing a series of well thought out acts of kindness to benefit local individuals and organizations as well as encouraging community members to participate with their own random acts of kindness on that day. Several local businesses have already planned acts of kindness to take place on Leap of Kindness Day. One local company is preparing to provide sailors at the U.S. Navy Training Center, in Ballston Spa with gift cards to thank them for their service. Another local company will visit the residents at the Wesley Community and Saratoga Hospital Nursing Home to deliver flowers. Another is collecting pet supplies and food to help patients at the Saratoga Hospital’s Community Health Center to care for their pets. A local charitable organization is planning to deliver home baked goodies to their major sponsors. One company plans to prepare breakfast for its local fire department. Area schools are preparing to hold school-wide events that may include penny drives, parents sending thank you notes to their child’s teacher, and special contests. A local organization is collecting supplies for the Code Blue Shelter in Saratoga Springs while another is collecting supplies for Operation Adopt A Soldier, and many businesses are organizing food drives to support local food pantries across Saratoga County. The chamber created a website at www.saratoga.org/leapofkindnessday where local organizations and individuals can get ideas on what they could do on their own or with their co-workers on Feb. 29 to join the Leap of Kindness Day celebration. Individuals are being invited to tip big, to make a donation to a local charity, or to simply send a thank you card to someone that means a lot to them on this extra day in 2016. Everyone is encouraged to share with their friends on social media the act of kindness they do on this day using the hashtag #leapofkindnessday, so that others might be inspired to follow their lead. While the local chamber is focusing its efforts on connecting people and organizations together in Saratoga County, it has shared its Leap of Kindness Day idea and logo with chambers of commerce in more than a dozen states from Texas, to North Dakota, Minnesota, Virginia and Rhode Island. The Leap of Kindness logo was designed so that it could be used by anyone anywhere that wanted to participate. “That is one of the ways we are paying it forward hoping that other chambers in other communities will also want to use this extra day to do something kind for someone else,” added Shimkus in the release.